The White Swan (formerly called “The Swan”) is one of the old inns of the town, and according to the late Mr Fred Morrell, is of two periods. The oldest part on the left would probably have been built over 250 years ago, and bears certain architectural features found in the building now known as the Bowling Green, which dates from 1757. 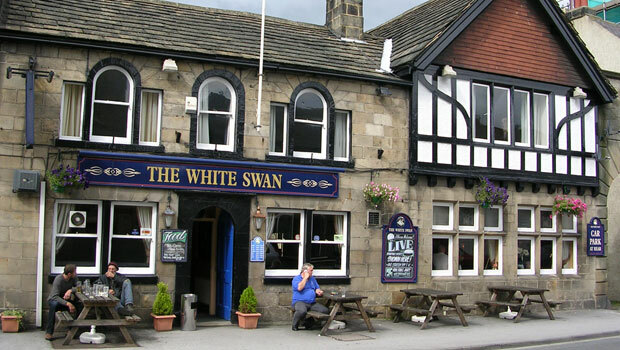 It is thought that old White Swan was built on the site of an earlier one, as the situation was such that it was the last inn out of the town in the eastward direction. The cellars underneath the old part of the inn are stone roofed and round arched, and are as soundly constructed as all inn cellars. The innholder in 1820 was Jane Cawood, whose husband carried on a business as a nail maker. In 1836, William Hardwick was occupier, with Quintin Rhodes as owner of the property. John Hoyle was landlord in 1870, George Forshaw in 1876, and Peter Bailey a year later. In 1879 Fanny Smith became licensee, followed by Fred Lummis in 1882, Thomas Vince (1888), Sandy Hutchinson (1900), Thomas W. Fearnley (1904), Harry Holmes (1913) and James Edwin Brooks in 1920, who transferred to the Black Horse a year later. For the last 34 years, the inn was been in the same family when Arthur Jackson took over in 1921, being succeeded by his son Arthur A. E. Jackson in 1939.